WORLD – Major food and beverage companies, packaging manufacturers, governments and non-governmental organisations (NGOs) are among 250 organisations that have signed a marker pact to eradicate plastic waste and pollution. The New Plastics Economy Global Commitment led by UN Environment and the Ellen MacArthur Foundation, aims to eliminate plastic waste at the source in an effort to establish a circular economy for the material. The commitment which is yet to be launched at the Our Ocean Conference in Bali, Indonesia, will see collaborations among the organisations which will eliminate use of ‘unnecessary’ plastic packaging through redesign, innovation, and the introduction of new delivery models. Nestle; The Coca-Cola Company; PepsiCo; Pernod Ricard; Unilever; Danone and Mars, Incorporated are among the organisations that have pledged for a circular economy for plastic. Supported by World Wide Fund for Nature (WWF), their pledge has been endorsed by the World Economic Forum, The Consumer Goods Forum (a CEO-led organisation representing some 400 retailers and manufacturers from 70 countries), and 40 universities, institutions and academics. It was also endorsed by more than fifteen financial institutions and five venture capital funds who pledged over US$200 million in commitment to a circular economy. The Global Commitment aims to create ‘a new normal’ for plastic packaging through three set targets. ‘Eliminate’ problematic or unnecessary plastic packaging and move from single-use to reuse packaging models. ‘Innovate’ to ensure 100% of plastic packaging can be easily and safely reused, recycled, or composted by 2025. ‘Circulate’ the plastic produced, by significantly increasing the amounts of plastics reused or recycled and made into new packaging or products. Businesses that sign the commitment will be required to publish annual data on their progress to help drive momentum and ensure transparency. “Ocean plastic is one of the most visible and disturbing examples of a plastic pollution crisis. “The New Plastics Economy Global Commitment is the most ambitious set of targets we have seen yet in the fight to beat plastics pollution. 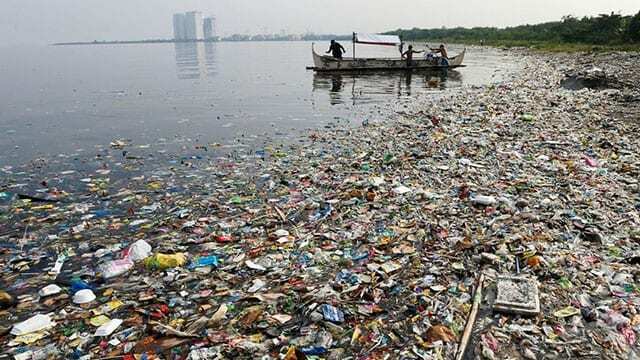 “It sets out the steps businesses and governments must take if we are to find a solution to the root causes of plastic pollution and we urge all those working towards dealing with this global issue to sign it,” said Erik Solheim, head of UN Environment. Nestle and Danone, major users of plastic packaging have signified intentions to embark on several research and development projects to achieve this universal goal. One of the ventures is the NaturAll Bottle Alliance, formed by Nestle in collaboration with Danone, with an aim to develop 100% bio-based PET for its water business. Unilever on the other hand joined forces with plastic recycling specialists, Veolia in a three-year collaboration agreement focused on driving emerging technologies in waste collection and recycling infrastructure. Following a study that showed UK consumers think plastic bottles should contain recycled content and that they would be willing to pay an average of 2.5p more, Veolia last month said that there was need for standardized packaging which makes products recyclable by design. Research shows that more than 8.3 billion tonnes of plastic has been produced since the early 1950s, most of which (60%) has ended into landfill or natural environment. While plastic packaging doesn’t solely contribute to plastic pollution, it is the biggest application of plastic and according to reports, if current trends continue, there could be more plastic than fish in the ocean by 2050.